We have an elderly cat who, for the first time in many years ended up with fleas. She shared them with us and our home and we ended up with an infestation. Ten years ago I would have driven to the vets for some noxious flea bombs and treated the house and the cat. Now I know more about the toxic and harmful effects of some of these chemicals I wanted to avoid them and choose greener options. As with many natural remedies, this requires care, patience and a commitment to regular applications to work. Here are natural ways to deal with fleas in your home. I’ve been cleaning wooden floors with a mixture of neem oil, and flea repellent essential oils: cedarwood, citronella, peppermint and eucalyptus. Neem oil works by making the fleas infertile; so it doesn’t kill them directly, but after a few weeks will interrupt the breeding cycle. Every morning I sweep and spray the floor with this mix. put 2 tablespoons neem oil in a plant mister. Top up with warm water and s tiny squirt of eco friendly washing up liquid. Then add your essential oils. I used 5-10 drops of each of the ones mentioned above. Label and store in a cool, dark place. If you have carpets, you’ll need to try the oils on an inconspicuous area first to check for discolouration. If you have pale carpets, then salt can work instead of neem. Put some regular table salt into a blender to make a fine powder and sprinkle it lightly but evenly on your carpets. You’ll need to leave this for at least 48 hours to work. Some people prefer to leave for a week. Salt works by desiccating the fleas, so you’ll need to vacuum the corpses and all the salt away afterwards. Make sure you do not have damp in your home before using this method otherwise the salt can pull moisture towards it and you’ll end up with a mess. Regular vacuuming is the key to prevention, along with regular washing of pet bedding or places where your animals sleep. Wash at 60 degrees (not very eco friendly I know!) or put small items into the freezer. Fleas like warm, undisturbed places, so move soft furnishings around, vacuum them, shake them out and keep your home aired. In our own bed (yes we ended up with fleas in our bed – ewwww) turning and airing helped. Some people are very sensitive to flea bites and end up with big hives. Mr Green is one of those people. On me, the fleas jump on, take a bite and apart from the initial pain it doesn’t hurt. For Mr Green, we treated his bites with myrrh tincture. This helps to prevent infection and soothes them. If children have flea bites be wary of using a tincture, as the alcohol will smart if the skin is broken. Spray with colloidal silver or use aloe vera instead. 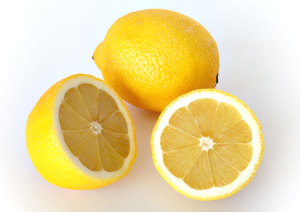 Cut 2 lemons into small pieces, place in a saucepan with 2 pints water. Bring to the boil, cover and simmer for 1 hour. Leave to infuse overnight and strain. Use this to spray your skin, carpets, soft furnishings or even your pets. What about you – what natural and effective ways have you found to treat fleas? We had fleas in every room. I use non toxic products on anything I can. I use borax for a lot of cleaning so I tried the borax and salt on all the carpets. Spread it with a seive and you can brush it with a broom. Let it sit for as long as you can. It will kill all the stages of the flea. I spread it in the morning and vacumned it up before the kids came home form school. Some say to leave it for days. I dont know how you could. You also should vacume very day, I did. Make sure there is some borax in the bag so the little buggers die. What we got out of all my work is no fleas, gone. The carpets are deoderized, clean and look great. Totally worth it. To find the fleas walk around with white socks, they jump on white. Pick them up with tape, a good way to kill right away they cant get away. I was totally thrilled. No fleas clean smelling carpets. Oh thank you for these ideas … I’m going to bookmark this page for future use! We were lucky and the fleas didn’t bite us (perhaps we don’t have delicious blood). But it made me crazy that they were around. For the two months that it took us to get rid of them, not a spot of dust fell that I wasn’t vacuuming and cleaning. Now I’m back to a more normal cleaning schedule but I do watch the cat closely for any sign whatsoever and if I see any, we launch into action. I wonder if some of your solutions would work on the patio? I sweep and try to keep it tidy but maybe spraying it would help ensure that the little “bad guys” stay away. Thanks, Mrs. Green!